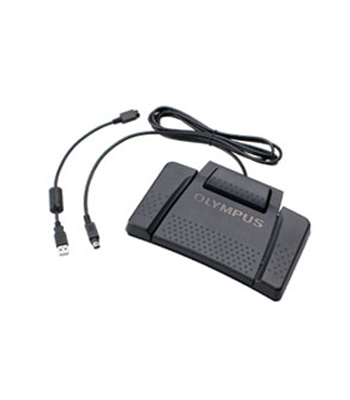 Compatible with Olympus Dictation Management System (ODMS) software and leading third-party applications, the four-pedal RS-31H footswitch combines the convenience of hands-free transcription with advanced features and configurability. The RS-31H is compatible with HID keyboards. It can be configured for use with third-party software by using Olympus’ free Configuration Tool (Download for Windows | Download for Mac), which enables users to program the RS-31H to alternate between the two operation modes. The tool also allows users to program footswitch pedals to mimic functions handled by keyboard shortcut keys/hot keys in third-party software. The center or top pedal feature a lock release for user configuration and preference.